DRAQ7™ is a new far-red fluorescent DNA dye that ONLY stains the nuclei in DEAD and permeabilized cells. 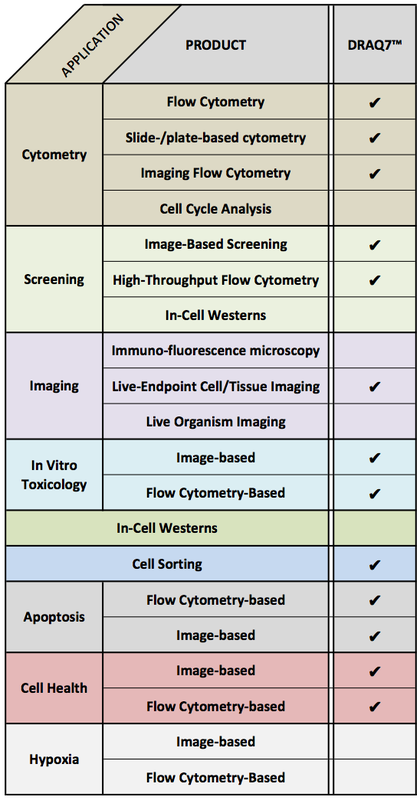 DRAQ7™ has many applications in imaging, cytometry and screening and is highly compatible with existing protocols across a wide range of instrumentation platforms. DRAQ7™ is available in two concentrations: 0.3mM and 1mM. The 0.3mM Packs come in two sizes; 250μl and 1ml. The 1mM Pack comes in one size - 1ml - and is meant for higher volume applications. Please get in touch if you would like to order bulk volumes of DRAQ7™. You can order DRAQ7™ directly from the website. DRAQ7™ is a small molecule closely related to DRAQ5™. It has peak absorbances at 600nm and 646nm. It fluoresces in the far-red / near infra-red (NIR) peaking at 697nm (bound to dsDNA). On a flow cytometer it is possible to detect DRAQ7™ using blue laser (488nm) excitation. DRAQ7™ is supplied as a blue aqueous solution in two concentrations: 0.3mM and 1.0mM. Products are shipped at ambient temperature, but on receipt packs should be stored at 2-8°C. Do NOT freeze! DRAQ7™ can be diluted in culture media (e.g. RPMI 1640) and physiological buffers (eg PBS, Hanks’s, etc.) and mixed with fixatives such as formaldehyde.